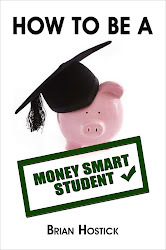 Welcome to the first official entry for Money Smart Students. My name is Brian Hostick. I am currently developing an entire program including website - blog - and public speaking appearances, all aimed at showing graduating highschool students and new college/university students how to handle their money. We really aren't given any kind of formal education with regards to money before we get sent out into the world on our own for college or university - or even to start living on our own in the real world. Our parents try - but they're just working from what they know themselves - and usually that's not enough. I hope to connect with as many young people as I can and give them some detailed information on how to not only survive - but thrive financially as they step out on their own. This is a project in the making. Keep checking back regularly for updates on speaking appearances, new information and links to other useful websites as we try to create thousands of MONEY SMART STUDENTS! !